The Battle of Cold Harbor is now fully engaged along a seven-mile front. 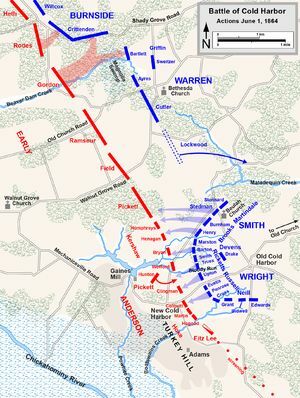 At one juncture, Union forces fiercely attack Confederate defenders, nearly breaking their lines. Elsewhere along the battle front, two small offensive attempts by the Confederates to feel out the enemy fizzle. While the rebels hold their own overall, federal troops end the day entrenched, in some instances, mere yards away from the enemy, effectively penning the Confederates in place. Losses for the day are high: 2,200 for the Union and 1,800 for the Confederates. As has often been the case during the battles of the Overland Campaign, the Union’s losses are more in total, while the Confederacy’s losses are greater percentage-wise. The coming of darkness is welcomed by both sides. Battle sounds fade away, replaced by the wailing and moaning of the wounded. Union forces in the back lines attempt to reposition themselves; some get lost in the blackness. Resolved, That we deeply sympathize with our Government in its efforts to suppress this rebellion, and will ever aid her to the best of our ability, with our lives, our property, our counsels and our prayers. Resolved, That as human slavery is a sin and an abomination in the sight of God—a terrible misery and disaster to man, and wholly inconsistent with the teaching of the word of God, and opposed to the genius and spirit of our institutions; therefore we do most earnestly hope and pray that when God, in His providence, shall remove the portentious clouds of war now darkening and desolating our land, no relic, except the lifeless and horrid remains of that institution, shall be found on any part of the soil of these United States of America. Many Union soldiers, including tens of thousands of former slaves now wearing Union blue, are as firmly resolved as home front Northern Baptists to defeat the Confederacy and bring freedom to enslaved blacks. White Southern Baptists, however, beg to differ with Baptists of the North and former slaves now bearing arms for the Union. An editorial in today’s North Carolina Biblical Recorder (reprinted from a Southern Presbyterian newspaper) is reflective of the views of most white Baptists of the South and merely the latest in a string of hundreds of articles in Southern Baptist newspapers defending the Confederacy, condemning the “fanaticism” of the abolitionist enemy (“fanaticism” and “fanatics” being common Southern terminology for abolitionism and abolitionists), and offering assurance of God’s hand upon the South. Yet like so many other Southern editorials in Baptist and other Christian newspapers within the past year, the substance of God’s will for his Southern (white) people is viewed as a bit of a puzzle. Many have predicted that this is the last year of the unhallowed war, now raging. The prediction is in accordance with our hopes and our prayers,–though we have not been able to endorse it. We earnestly hope that God will shorten these days of violence and savage atrocities, and speedily command our enemies to lay aside their hostile arms. But we know not whether we have good reasons to anticipate this desired result.–There is an element in this war–malignant fanaticism, making loud professions of unbounded philanthropy, endorsed by a self-righteous religion–such as probably was never before exhibited in the history of war; and we know not how far Divine Providence will permit this insane element to rage and rankle in the hearts of men, or what deeds of iniquity it may perpetrate, if left to execute God’s purposes of judgment upon us and upon our enemies. We can not foresee the course, or the future developments of this fanaticism.–It is very evident that its [?] desire no union with the Confederate States. They are not fighting for Union or for the Constitution–but for political ascendancy and power over other parties in the next election campaign. Union with us–a forced union, if it could ever be consummated,–would be a curse for them, and not a blessing: The feelings of detestation awakened in the heart of the South, by their falsehood, robberies and murders, by their base and despicable acts of vulgar tyranny, forbid all hope, and even the shadow of hope, of anything like union with the Lincoln party. The claim that Southern whites will not forgive the despicable North and the Republican Party, should the Union win the war, is a clear foreshadowing of what the future holds.